When you need to attend a party or a wedding, Will you feel confused whether you shall wear your Fitbit bands to the party/wedding or not? Becuase your Fitbit don't fit for your dress or suit. Please don't worry, with our Fitbit replacement bands, you can wear your Fitbit on any occasion. 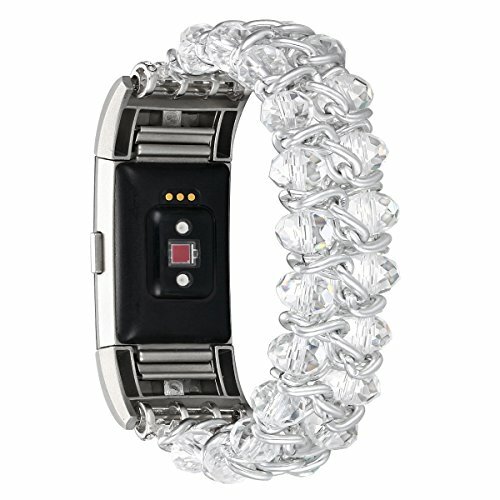 Our Fitbit bands/straps are made of crystal bling beads, durable elastic rope, rhinestone bling stainless steel slider. When you wear it, it looks like you're wearing a beaded bracelet rather than a bulky Fitbit Band! ✔ Perfect holidays' gift choice for Birthday, Anniversary, Wedding, Thanksgiving day, Christmas etc. ✔ Fitbit Series band available: Like Fitbit Charge 2, Fitbit Ionic, and Fitbit Versa. ✔ Other Charge 2 styles bands can be choosen. Material: Stainless steel for the connector part, Faux crystal beads, Durable elastic rope.This listing is for the replacement strap only, Fitbit watch is not included. To replace the old strap: firstly, press the connector to slip your watch band out. Then slide your new Fitbit band in. Notes:Fastgo never authorizes any other third-party to sell our products, and please directly buy from Fastgo to get the authentic products in guarantee and protect your own interest. ★【Buy from "fastgo", Support the "original"】This original design originated from designer Ms "Rachel" of "fastgo". It aims to create a feminine Fitbit charge 2 band, to help alter the bulky band to a stylish bracelet. So kindly choose to buy from "fastgo" only. ★【Easy to cause allergy? How about size?】Totally Nickle free, Never makes people get allergic. Handmade Crystal beads + Stainless Steel Slider+sturdy stretch cord. And it is one-size-fits-all kind which fits for 99% percent females. ★【Will it affect counting Steps and heartbeat tracking?】This dressy bands for charge 2 for women makes your fitbit watch band looks like expensive jewelry, same time it holds the Fitbit band close enough for the heartbeat and step counting to work accurately. ★【Will it slide around or stay in place?】 It slips snugly over your wrist but stays in place and does not slide around for 99% females. ★【Fit for what kind of occasions?】 This cute charge 2 band works for casual or dressy, regular or special events . Suitable for holiday parties, concerts and very proper to be used as gifts/presents for Wedding day, Birthday, Valentines' day, Mothers' day, Christmas, Thanksgiving Day etc.